Ewood Park was opened in 1882 and has an all-seater capacity of 31,367. 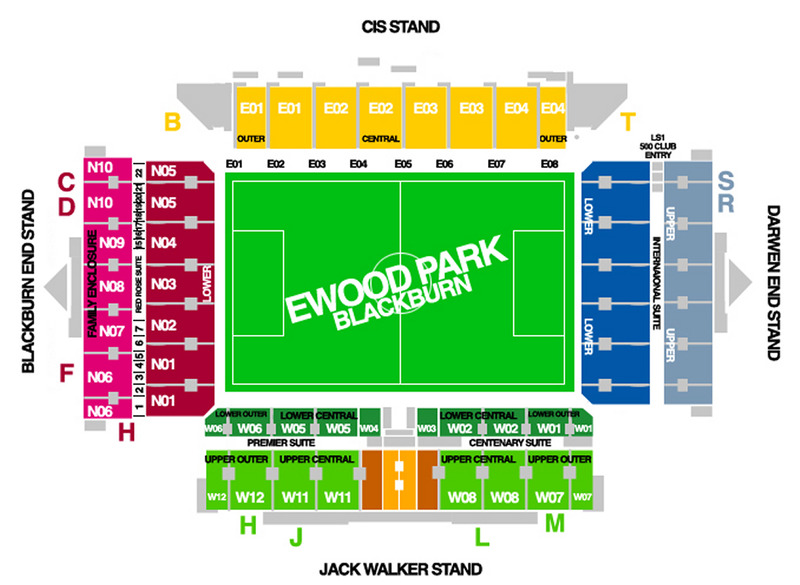 The Darwen End, Blackburn End, and Jack Walker Stand are all very similar. All two tiers and much newer builds than the Riverside Stand (named as such because it stands practically on the banks of the River Darwen). This stand is a single tiered affair. There are very few if any bad views from within the stadium. Approximately 4,000 visiting supporters can be catered for and they're housed in the Darwen End of the ground. How much of this stand is allocated to visitors depends on the likely size of the following. Where the demand is less than around 2000 seats, the lower tier to the right of the goal (as viewed from the pitch) is normally used. If more away supporters are expected, the upper tier is used and, for the biggest followings (and sometimes on security advice), the whole of the stand will be given over to visiting supporters. The views from anywhere in the stand are very good. The Blackburn End of Ewood Park itself is the Blues Bar, a Rovers-themed sports bar, for season ticket holders and blues bar members. The beer tends to be on the pricey side, but they do serve food too and there are lots of screens around the walls, showing a feed from RoverVision or Sky Sports News. The club has recently opened a lowered bar area, to accommodate disabled fans wishing to order food or drink. Elsewhere, in terms of pubs, the Fernhurst, which is on Bolton Road just a stone's throw away from the Darwen End of the stadium, is officially designated as the away fans pub. Another couple of options are the Golden Cup and Uncle Jacks, both within a few minutes of the stadium. There are several takeaway outlets along Bolton Rd in both directions away from the ground. Including a chip shop, pie shop and a couple of sandwich shops. Plenty of local car parks are provided and recommended by the club although there is a limited amount of street parking in surrounding roads. Be aware of the residents only sections however. If needed, there are plenty of buses serving the stadium which make access to and from very easy. The nearest / closest train station to Blackburn Rovers' Ewood Park is the Blackburn railway which is about a mile and a half from the ground, about a 20 minute walk away. The station empties onto the Boulevard, the central bus station from where several buses (3, 3A, 3B, 46 and 346) run past the ground (heading for Darwen). Mill Hill station, on the line between Blackburn and Preston, is actually nearer the stadium (about a mile or a 15 minute walk), but beware not all trains on the line stop there, though football special trains often use Mill Hill rather than Blackburn. For further information about journeys by public transport, visit the Blackburn Transport website at Blackburn Transport or call their enquiry line on 01254 504800. Refreshments: The walk from the high school passes plenty of away friendly pubs, including the Bear and the Golden Cup, but there's only one destination for away fans…the Fernhurst! A massive pub across the street from the away end, and always has food and beer outlets outside so everyone can get something. What makes it even better is the actual food vans…how many football grounds can you get a bowl of roasties and gravy before a match? Worth it every time! Never had to buy food inside the ground as a result! Impressions: Fairly standard, not great, not rubbish. Same goes for the seats, decent views from all over the lower tier either standing or sitting, as long as you're not right at the front! Atmosphere: Rubbish in all honesty! And I include ourselves in that despite it consistently being our biggest away following of every season! Local away's with bigger followings often mean we have a worse atmosphere, and this is the main culprit. Doesn't help that it always seems to be a terrible game too. Enjoy: The ground itself is fairly alright, the atmosphere and the game itself are always dire …but the day itself means it's always worth it… and them roasties of course! 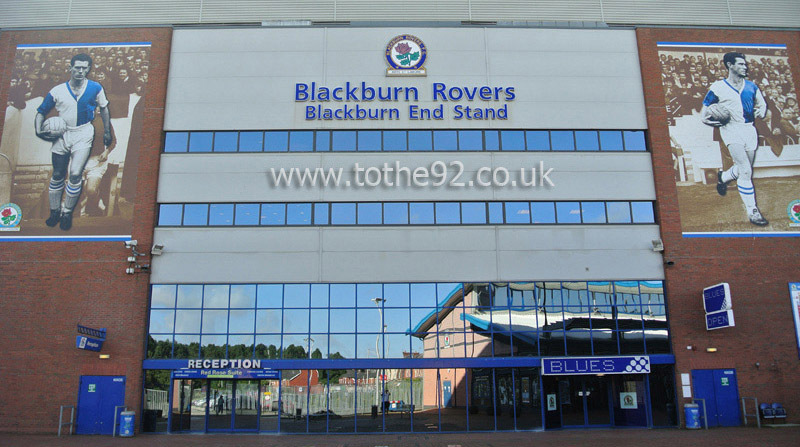 Have you been to Blackburn Rovers' Ewood Park? To tell us about your experiences and to feature on the site, simply complete the fans review form below!